The Hammond organ is an electric organ, invented by Laurens Hammond and John M. Hanert and first manufactured in 1935. Various models were produced, which originally used tonewheels to generate sound via additive synthesis, where component waveform ratios are mixed by sliding switches called drawbars and imitate the pipe organ's registers. Around 2 million Hammond organs have been manufactured, and it has been described as one of the most successful organs ever. The organ is commonly used with, and associated with, the Leslie Speaker. Tonewheel organs generate sound by mechanical toothed wheels, that rotate in front of electromagnetic pickups. Each tonewheel assembly creates tones with low harmonic content, close to a sine wave. Inside the coil is a permanent magnet. As the teeth of the tonewheel pass by, the strength of the magnetism changes—when the tip of a tooth is closest to the tip of the magnet, the magnetism is strongest. As the magnetism varies, that induces an alternating current (AC) in the coil, which becomes one of the frequencies used in harmonic synthesis. A 1935–1938 The first Hammond in production. Two 61-note manuals, 25-note pedalboard, 2 x 9 drawbars per manual, 2 pedal drawbars, 9 presets per manual, a tremolo effect generator ("tremulant"). B-A 1938 Model B-C style organ with built-in player organ mechanism (possibly Duo-Art), custom built by Aeolian-Skinner. B-3 1954–1974 The best known Hammond. Similar to the B-2, but with the added harmonic percussion circuit. Made famous by Jimmy Smith who influenced numerous other players. H-100 1965–1969 Tonewheel organ with additional features. Not generally considered to be particularly popular. HX-100 1970-1975 Version of the H100 in a pseudo X66 case for stage work. Supplied with D10 speaker. L-100 series 1961–1968 First Hammond to retail for under £1,000. Much abused by Keith Emerson. L-122A has extra percussion voices. L-222 came with an integrated keyboard cover or fall. L-100-PN / L-100PNS – Belgian version, also sold in Netherlands. S means a version with pedal sustain. P-100 / L-100-P – converted L-102, sold in Germany and Denmark. M 1948–51 First spinet organ. 2x44 key manuals, 12 note pedalboard. M-100 1961–1968 Tonewheel spinet organ, replacing the M series. Includes presets. T-200: T-100 with built in leslie and extra percussion. T-400: as T-200 but with Drum machine. T-500: as T-400 but revised case.Last tonewheel built. XTP: Futuristic T-500 with pull out speakers leaving organ on pedestal. Two models in Church-styled cabinet were made under military specifications, and named G (G for "Government contract", with chorus), and G-2 (with vibrato), to be installed in chapels and officer's messes of U.S. Army and Navy. Vacuum tube musical instruments mean electronic musical instruments generating sound with vacuum tube-based electronic oscillators. Hammond Organ Company commercialized it in the late-1930s as Novachord (1939–1942) and Solovox (1940–1948). Especially, new designs introduced on Novachord — subtractive synthesis and frequency divider — were immediately followed by many manufacturers of electronic organs and polyphonic synthesizers during the 1940s-1970s. However, Hammond Organ Company did not adopt these on main products until the late-1960s, except for S series chord organ (1950–1966) and "Solo Pedal Unit" on RT series and D-100 (1949–1969). Novachord (model H) 1939–1942 First commercial polyphonic synthesizer. Although Novachord itself is not referred to as an electronic organ, its basic design became mainstream, being implemented in electronic organs and polyphonic synthesizers during 1940s-1970s. Solo Pedal Unit (or Pedal Solo Unit) provides a monophonic bright bass sound on RT series and model D-100 consoles, layered with tradiotional polyphonic tonewheel pedal sound. Although Solo Pedal Unit is highest-note priority and it can play only one note at a time, the players can play polyphonic bass lines by the help of traditional pedal sound. The sound generator is electrically similar to Solovox Model L. It consists of a vacuum tube oscillator and five frequency divider circuits, controlled by a volume and 8-stop tablets (Bourdon 32', Bombarde 32', 16', 8', 4', 2' & 1', mute, pedal solo on) placed on the right side of lower manual. Although there are five revisions of units, these are interchangeable on all RT series consoles. Hammond started to produce transistor organs when the production of tonewheels became too expensive, switching to full-time Integrated Circuit (IC) models in 1975. Aurora (Century, Custom and Classic) 1975 First composite spinet organ with both drawbars and electronic voices, no tonewheels. Classic top of range with strings brass and presets.Final model had pro-chord. B3000 1978 (or 1975) Solid-state copy of the B-3, with additional string division, electric and grand pianos. Key click was re-introduced. Supplied with matching Leslie HL-722. (model V,VS) 1969–1970s Entry-level all-tab transistor spinet organ, no tonewheels. This series were all designed in the United States, built in Japan, and subsequently also assembled in England: Initially, first series were built by Yamaha (c.1969–), then by Nihon Hammond during 1973–1975. Subsequently Hammond UK began to import these models in kit form, and assembled in proper wooden cases for domestic market. Colonnade 1979 or 1982 Console version of Aurora Classic. Commodore — Single set of drawbars. Elegante 1980s Hammond 1980`s Flagship 2 x 61 note manuals,25 pedals everything on it. Concorde 1972 - c.1977 (or 1973) First LSI-based Hammond console organ with drawbars, no tonewheels. This model was once erroneously advertised as a next generation top model take over the X-77, called X-99; though, its official name was a Concorde. Cougar 1973–1976 Transistor spinet organ with drawbars, in some extent, corresponded to a kind of successor of L-100 series tonewheel spinet organ, although its new drawbars arrangement is slightly exotic; its upper manual has normal nine drawbars; on the other hand, lower manual has only two 8' drawbars with sawtooth. This anomalous design was only followed by a few models (8000 series, 8100 series, and 8200 Aurora series). Dolphin 1973–1976 Spinet organ with built-in polyphonic synthesizer and 20 one finger chords. Maverick 1973–1975 Middle-priced all-tab spinet organ. Phoenix 1972 First LSI-based all-tab Hammond spinet organ. Piper Autochord 1970–1979 First automatic chording instrument. Single manual, with automatic rhythm, automatic chording and no bass pedals. Portable B-100 1980–1984 Single manual version of B-250. Portable B-200 — Successor of X-5, portable version of Aurora 8222. Portable B-250 1980–1984 2 x 61 note manuals. Portable B-300 — B-200 plus strings, portable version of Aurora Classic 232000. Portable B-400 — Only drawbars to upper, drum machine and Midi. Portable X-2 1978 Single manual version of X-5. Portable X-5 1979 Portable spinet, transistor copy of the B-3 (or Porta B), derived from Ace Tone GT-7 circa 1971. Manufactured by Nihon Hammond, a Japanese joint venture between main company and Sakata (parent company of Ace Tone). Regent 1973–1976 First all-tab theatre style Hammond organ. Romance series 1977–1983 Integrated circuit generated spinet organ. No drawbars. Sounder 1973 First Hammond to retail for under $500, sold through both music and mass merchant outlets. Single manual organ. After the Hammond Organ Company ceased trading in 1985, production initially went to Noel Crabbe's Hammond Organ Australia, and then to Suzuki Musical Instrument Corporation, who, under the name Hammond-Suzuki, manufacture digital organs. Super B 1986 First full-digitally sampled Hammond organ, with dual manual, downloadable voice tables, and MIDI. XB-2 1991–1998 Single manual organ. First digital organ produced by Hammond-Suzuki. XB-3 1993–1998 Dual manual organ with 4 sets of drawbars, reverse colour presets and waterfall keys. In an extended B3 case. XB-5 1993—? Two manual organ with two sets of drawbars and bass drawbars. XK-3 2004–2007 Same internals as a New B-3 with cheaper keyboard base and built in Leslie simulator. Can be expanded with optional lower manual, stand and pedalboard. ^ Waring 2002, p. 319. ^ Reid, Gordon (November 2003). "Synthesizing tonewheel organs". Sound On Sound. Retrieved 25 April 2011. ^ a b Vail 2002, p. 68. ^ a b c d Vail 2002, p. 74. ^ Vail 2002, pp. 74-75. ^ a b Vail 2002, p. 71. ^ "Aeolian/Hammond Player Organ", Hammond Products, OrganHouse.com . – Two manufacturer plates can be confirmed : one is "Hammond Organ Mechanism Model BA" by Hammond Instrument Co., and the other is "Aeolian-Hammond Player model BA" by Aeolian-Skinner organ Co.
^ a b Vail 2002, p. 69. ^ a b c d e f g Spark, Rod (October 1997). "The History Of The Hammond". Sound on Sound. Retrieved 30 July 2013. ^ a b Vail 2002, p. 49. ^ Vail 2002, p. 76. ^ a b Vail 2002, p. 72. ^ Vail 2002, p. 79. ^ Vail 2002, p. 79-80. ^ Vail 2002, p. 81. ^ Vail 2002, p. 83. ^ Vail 2002, p. 85. ^ Vail 2002, p. 86. ^ Faragher 2011, p. 78. ^ BlueBook Hammond and Leslie & c.1984, p. H-9. ^ De Hammond Encyclopedia, Porta B - Portable L 100 serie uitvoeringen. ^ a b c Vail 2002, p. 89. ^ De Hammond Encyclopedia, R 100 serie Retrieved 5 August 2013. ^ a b Faragher 2011, p. 85. ^ Vail 2002, p. 93. ^ Vail 2002, p. 96. ^ Howell, Steve; Wilson, Dan. "Novachord". Hollow Sun. Retrieved 26 April 2011. See also site's History page. ^ Hammond Zone, The Hammond Solovox (1940). ^ Pedal Solo Unit for RT, RT-2, & RT-3 Consoles (PDF). Service Manual. Hammond Organ Company. ^ Kakehashi 2002, p. 176. ^ Riley 2006, pp. 58,63. ^ BlueBook Hammond and Leslie & c.1984, p. H-33. ^ Faragher 2011, p. 75. ^ a b De Hammond Encyclopedia, V-100 Cadette series — Serial number plates by Yamaha were printed as: "Built by Nippon Gakki Company, Limited to Specifications of Hammond Organ Company, Chicago, ILL. Made in Japan". Also vivid color tablet buttons and "rice paper finish" wood print panel seem to share the design language of Yamaha Electone at that time. ^ a b De Hammond Encyclopedia, VE & VS series — De HAMMOND VS-serie — Serial number plates (probably not by Yamaha) were simply printed as: "Hammond International, Chicago, ILL. Made in Japan". ^ BlueBook Hammond and Leslie & c.1984, p. H-32. ^ De Hammond Encyclopedia, Concorde. ^ De Hammond Encyclopedia, X-99. ^ BlueBook Hammond and Leslie & c.1984, pp. H-20–H-22. ^ Introductory Section, Service Manual 1970, p. SC-12. ^ BlueBook Hammond and Leslie & c.1984, p. H-18. ^ BlueBook Hammond and Leslie & c.1984, p. H-14. ^ De Hammond Encyclopedia, Hammond Piper Autochord. ^ De Hammond Encyclopedia, Hammond B-200 Portable. 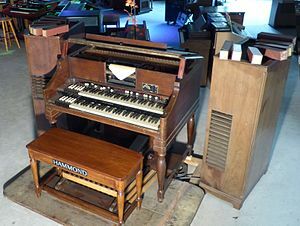 ^ De Hammond Encyclopedia, Hammond B-300 Portable. ^ De Hammond Encyclopedia, De Hammond B-400 Portable. ^ De Hammond Encyclopedia, Hammond X-2. ^ De Hammond Encyclopedia, Hammond X-5. ^ De Hammond Encyclopedia, Regent 4100 Series. ^ Welch, Jerry (2011). "Organ Identification". Organ Service Company, Inc. Retrieved 31 July 2013. ^ Faragher 2011, p. 14. ^ De Hammond Encyclopedia, Hammond Super B. ^ a b c d Magnus, Nick (October 1998). "Hammond XB1". Sound on Sound. Archived from the original on 2016-03-03. Retrieved 2 August 2013. ^ De Hammond Encyclopedia, Hammond XB-5, "Bovenmanuaal met 61 toetsen - 9 drawbars / Ondermanuaal 61 toetsen - 9 drawbars / Pedaal 25 tonig - 2 drawbars"
^ Jacques, David (2001). "Review: Hammond-Suzuki XK-2". none. Archived from the original on 2014-12-27. Retrieved 2 Feb 2014. ^ Hugh Robjohns. "Hammond B3: Modelled Electromechanical Tonewheel Organ". Sound On Sound (July 2003). Archived from the original on 2006-11-06. ^ Robjohns, Hugh (July 2005). "Hammond XK3/XLK3 & Leslie 2121/2101". Sound on Sound. Retrieved 31 July 2013. ^ Hart, Terry (12 August 2011). "Hammond XK-3C". Mixdown Magazine. Archived from the original on 22 February 2014. Retrieved 2 August 2013. ^ Fortner, Stephen (13 December 2011). "Hammond SK1". Keyboard Magazine. Retrieved 2 August 2013. Faragher, Scott (2011). The Hammond Organ : An introduction to the instrument and the players who made it famous. Hal Leonard Corporation. ISBN 978-1-4584-0287-5. "De Hammond Encyclopedia" (in Dutch). Hammond Toonwielorgelvereniging Netherland [Hammond Oragn Club Holland] (hammondclub.nl). Retrieved 2013-08-06. Service Manual. Hammond Organ Company. Introductory Section (Hammond Organ Models) (PDF). Winterpark, FL: Audio Playground Synthesizer Museum. 2001 . Archived from the original (retyped PDF) on 2010-11-24. Retrieved 2013-08-07. (recreation of original in 1970); Originally published as: Introductory Section. Service Manual. Melrose Park, Illinois: Hammond Organ Company. 1970. HO-495-1-2500. The Blue Book of HAMMOND (PDF). 2001 [c. 1975]. Archived from the original (retyped PDF) on 2016-03-04. Retrieved 2013-08-07. Note: It seems a retyped copy of original "Introductory Section" of Service Manual in circa 1975, or similar. BlueBook Hammond and Leslie (scanned image in PDF). 2009 [c. 1984]. Retrieved 2013-08-07. Note: It seems a reprint of "Introductory Section" of Service Manual circa 1984, or similar. "History & Reference". 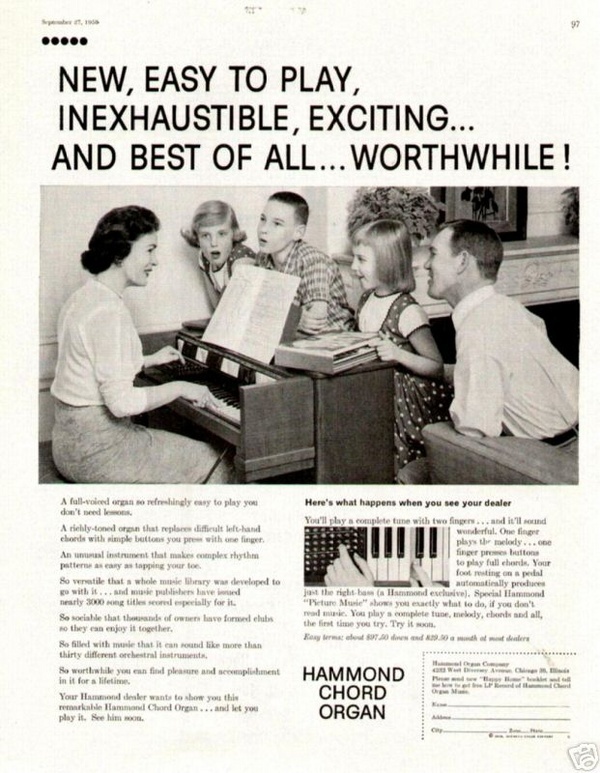 Hammond Zone (hammond-organ.com). Archived from the original on 2018-02-22. Retrieved 2013-08-06. This page was last edited on 23 February 2019, at 22:14 (UTC).